Take a look at where CFofCHS has been featured! THE POST AND COURIER (H. RASKIN) — Craft drinkers in Charleston can already down wine in painting classes and candle-making workshops, but Custom Frames of Charleston is the first local venue to offer customers the chance to tipple and frame pictures at the same time. "I'm going to be supervising, of course," says owner Maelyn Belmondo. Although participants will use covered blades to cut mats, she adds, "this isn't the place to come get sloshed." 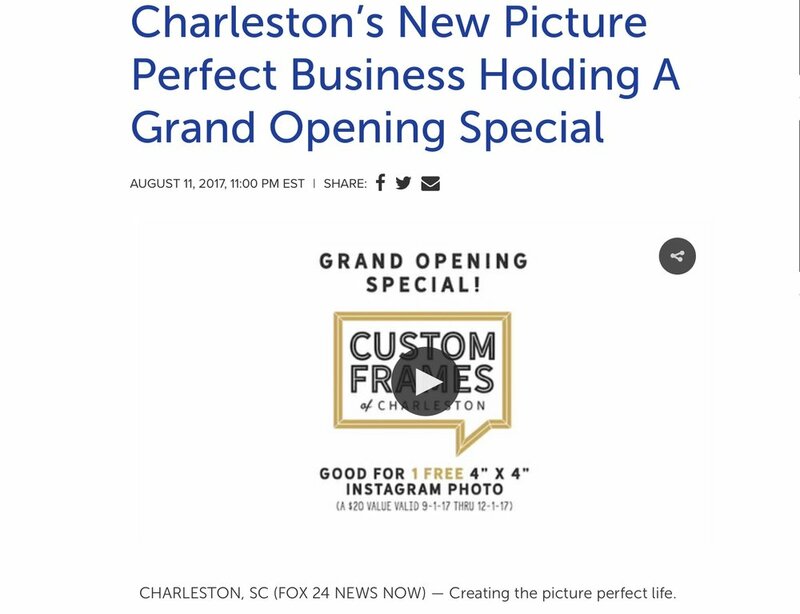 CHARLESTON, SC (FOX 24 NEWS NOW) — Creating the picture perfect life. Maelyn Belmondo, military veteran and meteorologist, is now an entrepreneur. Custom Frames of Charleston, located downtown Charleston, stands Belmondo’s new studio where friends can drink and get crafty. This studio is the first local venue to offer customers chance to drink alcohol and frame pictures. CHARLESTON, SC (FOX 24 NEWS NOW) — Downtown Charleston recently celebrated a grand opening on Wentworth Street. Maelyn Belmondo, Airforce verteran and owner, celebrated the opening of her new store — Custom Frames of Charleston. This is the first local venue to offer customers chance to drink alcohol and frame pictures. CHARLESTON, SC (WCSC) — Yelp has launched its first-ever Local Economic Outlook report which reveals the cities, neighborhoods, and industries that offer the most opportunity for small businesses to thrive. Charleston landed within the top 10 cities in the country to start a small business. Maelyn Belmondo is the owner of Custom Frames of Charleston – a DIY picture framing experience. She decided to open it after her tour with the military ended here in the Holy City. “I could not think of a better place to open a business because the people here are just so welcoming,” Belmondo said.